A new Taub Center study finds that Arab Israeli pharmacists are well-integrated into the Israeli labor market, although their participation is accompanied by many more difficulties than those encountered by their Jewish Israeli counterparts. In light of this finding, the study proposes a number of policy steps to narrow these gaps. 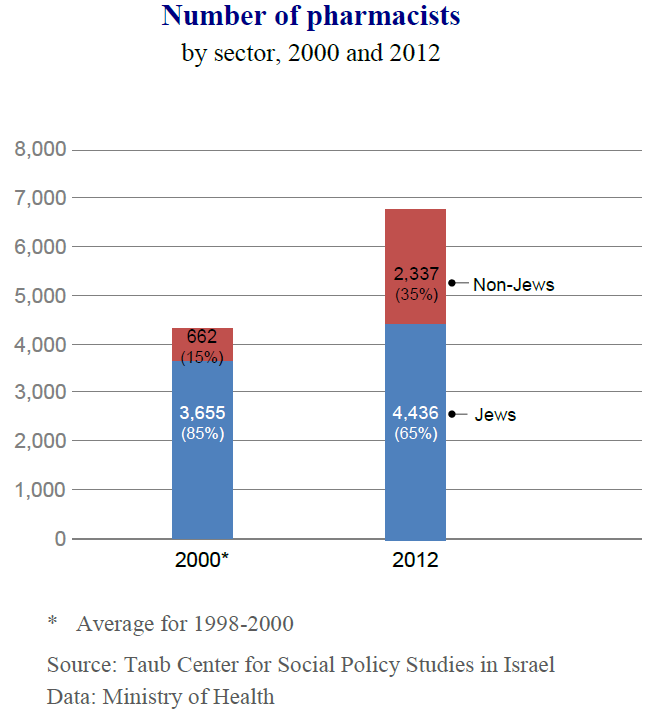 For many years, the Arab Israeli population has struggled to find a place in the Israeli labor market. This is reflected in relatively low employment rates, few working women and limited representation in those occupations considered prestigious. For this reason, the relatively rapid entrance of Arab Israelis over the past decade into the labor force in the field of pharmacy stands out. A new Taub Center research study conducted by Prof. Noah Lewin-Epstein, Prof. Alexandra Kalev, Erez Marantz, and Shimrit Slonim examined how Arab Israeli pharmacists integrate into the private retail marketplace, as a test case for the integration of Arab Israelis (and in particular those with an academic education) into the Israeli labor market. According to the researchers, the integration of this group in general is positive, both from the perspective of the satisfaction of the Arab Israeli pharmacists themselves and as an indicator for the potential integration of Arab Israelis into the labor force – an outcome that would likely strengthen the Israeli economy. Nevertheless, the Taub Center study points to a number of difficulties and obstacles that characterize the entrance of Arab Israeli pharmacists into the marketplace. The researchers also provide policy recommendations that may improve the situation. According to Ministry of Health data, the number of registered pharmacists of employment age has grown by 50% in the past 12 years. Along with the overall expansion in the profession, the number of Arab Israelis in this field has also grown, and Arab Israelis now represent about one-third of all pharmacists (see the figure). To a great extent, this growth stems from the entrance of Arab Israeli women into the profession. For a number of years, the majority of Jewish pharmacists have been women – about 58% in 2012 – while among Arab Israelis, the field was dominated by men. Over the past decade, the share of Arab Israeli women in the field has risen, and the figure is nearing that of Arab Israeli men. A key factor for the demographic change within the pharmacy field is linked to changes in opportunities for higher education among the Arab Israeli population. Since the signing of the peace accords between Israel and Jordan in 1994, the doors to higher education in Jordan have opened for Arab citizens of Israel. Arab Israelis now have the opportunity to study pharmacy in Jordan and then to return and integrate into the profession in Israel. In fact, in 2005, more than one-third of all pharmacy licenses (for both Arab Israelis and Jews) were issued to graduates of institutions in Jordan. The researchers conducted in-depth interviews with pharmacists, managers and owners of pharmacies, with the goal of examining the characteristics of the various career stages within the pharmacy field and identifying the obstacles to integration of Arab Israeli pharmacists into the profession. The findings show that the experiences of Jews and Arab Israeli pharmacists differ from the outset; the process of finding an internship position differs greatly between the two groups. For most Jews, internships are often found prior to completion of studies; while for their Arab Israeli counterparts, this can be a very difficult process. This stage is particularly challenging for those studying in Jordan, who find that employers prefer those who have studied and graduated from institutions in Israel. Graduates of Jordanian institutions are unable to work as pharmacy assistants during their studies, unlike those studying in Israel, who are often able to transition from a pharmacy assistant position into an internship at their workplace. In addition, many pharmacy employers feel that the Jordanian coursework is of poorer quality than that in Israel. Such challenges in finding an internship position mean that many Arab Israeli pharmacists have to compromise at this stage, often even starting to work without pay (which is against the law), or starting as a pharmacy assistant – a position that is generally reserved for students. The job search phase for Arab Israelis is also prolonged relative to that of Jewish pharmacists, although it is generally shorter than the internship search process. The Taub Center interviews found that the main reason for the shorter job search relative to the internship process is that Arab Israeli pharmacists tend to keep working where they do their internships (33% of all interviewees). In contrast, following their internship and qualification exam, Jewish pharmacists tend to change their place of employment to somewhere more suitable for them (only 8% of the Jewish interviewees stayed on to work where they had interned). The Taub Center study notes that even though a large share of the pharmacists in the country is Arab Israeli, this group’s representation among management is lacking. This finding can be explained, at least in part, by the fact that Arab Israeli pharmacists tend to be younger than their Jewish counterparts and have not yet accumulated the seniority necessary for advancement to senior positions. Nevertheless, according to the Arab Israelis who were interviewed, the most senior management positions, decision making and pharmacy chain management had no Arab Israeli representation. A feeling of discrimination regarding the large pharmaceutical companies was also evident in the interviews. The Arab Israeli interviewees noted that the large pharmaceutical companies have army service as a prerequisite for employment, effectively closing the doors to this population. When questioned about the personal level – daily interactions and social relations in the workplace – interviewees generally responded positively. Overall, the interviewees raised certain challenges, like dealing with women wearing the hijab or speaking in Arabic among colleagues at work. The overall picture is encouraging, however, because it indicates cooperation on professional grounds. Furthermore, direct contact in the workplace between Arab Israeli and Jewish pharmacists also allows them to get to know each other. Nevertheless, ethnic tensions between Arab Israeli pharmacists and Jewish clients appear to be prevalent. The interviews revealed that there are occasions when a client is dissatisfied and expresses his anger with ethnic slurs. According to the study, however, the most important aspect of these incidents is the way they are handled by the system – sometimes employers support the pharmacists while on other occasions, the customer service policy leads to tolerance for racist remarks. Religious holidays are another problem that has not been adequately managed by the system. In most cases, pharmacists indicate that their employers and colleagues are considerate in this regard, but it seems that there are no official organizational policies on the matter. Those who are unable to find a substitute for their shift are often forced to work even on their religious holy days. The Taub Center study proposes several steps to improve the integration of Arab Israeli pharmacists. Some employers are reluctant to grant internships to graduates of Jordanian institutions because they are concerned that the level of studies is inferior or because graduates are unfamiliar with the local market and products. To remove this employment barrier, the state should run a course for graduates of Jordanian institutions to familiarize them with the local market and pharmaceuticals in Israel while simultaneously bridging between potential employers and Arab Israeli pharmacists. The study also suggested that the state subsidize intern salaries, primarily for those graduating with honors from Jordanian institutions. According to the researchers, these actions are worthwhile not just for Jordanian graduates, but also for Israel, which is not opening additional pharmacy programs due to its reliance on graduates of foreign institutions. In addition, the researchers recommended closer regulation of the religious rights of workers. In particular, policies should be developed that are sensitive to the uniqueness of the month of Ramadan and that require the employer to take steps to ensure a number of days off, shifts that are easier for employees who fast, and a longer break to eat the evening meal (with pay), for those who work evening shifts during this month. In order to protect pharmacists from abusive customers, the researchers suggested enacting a law against bullying in the workplace, requiring the employer “to deal effectively with cases of harassment or bullying, and to do everything possible to prevent and to rectify the harm caused by harassment.” Proposing this bill as well as raising consciousness among pharmacists and their employers will help create a safe working environment for Arab Israeli pharmacists.